gingership | Two redheaded buds adding flavor to the kitchen! Two redheaded buds adding flavor to the kitchen! 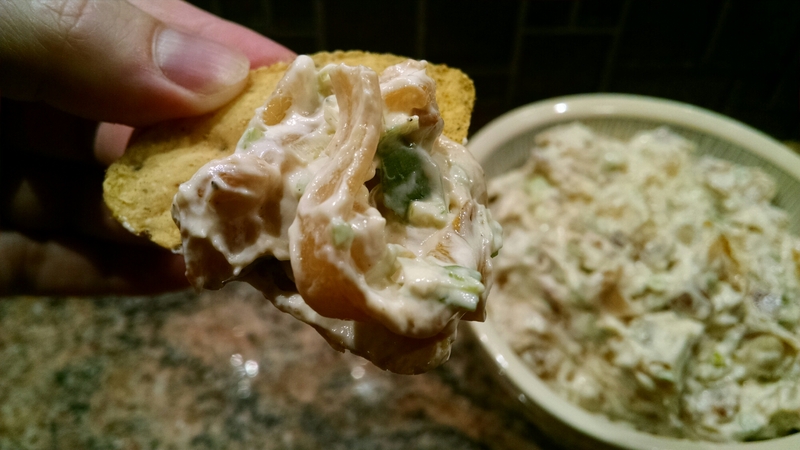 I have made this dip twice now and boy, is it delicious! It is quickly becoming my new favorite dip which is perfect timing since football season is upon us. 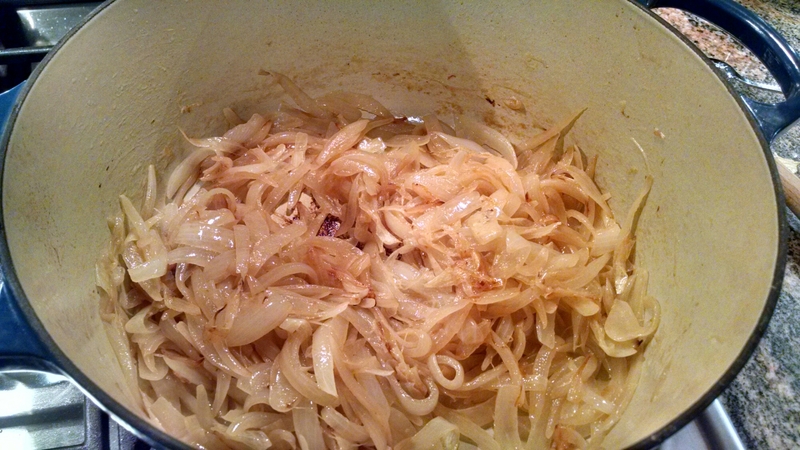 It has few ingredients but is a bit time consuming since caramelizing onions takes nearly an hour. Trust me though, it is worth the time. 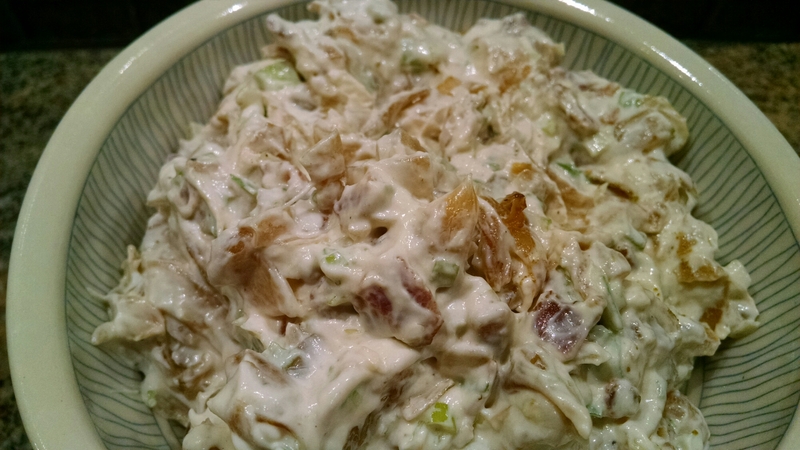 Crunchy bacon, sweet caramelized onions, fresh scallions… mmm, I wish I had some leftover so I could eat some right now! However it got devoured yesterday at our Broncos vs. Seahawks football party (and we will not discuss the game’s outcome, thank you very much). Start with heating the butter and oil over high heat in a 12-inch dutch oven. Stir in the sugar and salt. Add onions and stir to coat. Cook, stirring occasionally, until onions begin to soften and release moisture, about 5 minutes. Lower the heat to medium-low and cook, stirring frequently, until the onions are deeply browned and slightly sticky, about 45 minutes. Remove from heat and add 1 Tablespoon water and freshly ground pepper. While the onions are cooking, cut the bacon into ¼-inch thick pieces. Cook the bacon in a nonstick pan over medium heat until crisp, about 8 minutes. 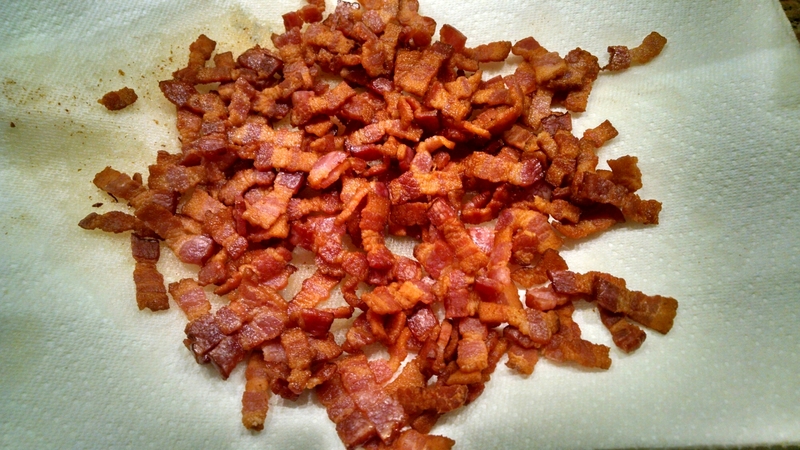 Transfer the bacon to a paper towel lined plate and let cool. 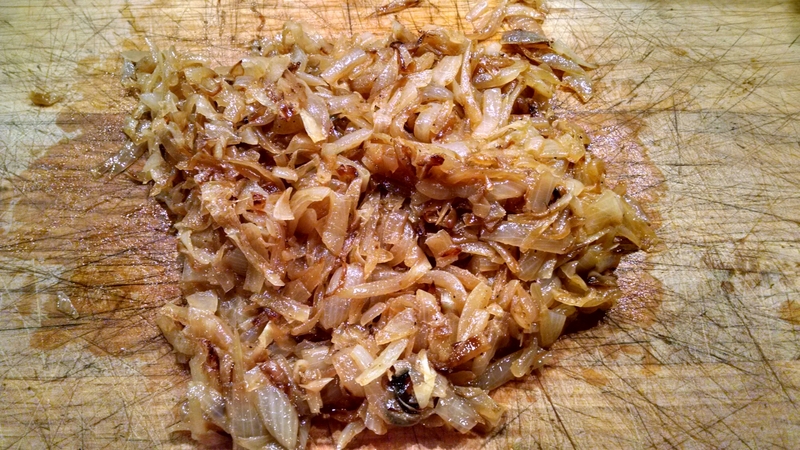 Transfer the caramelized onions to a cutting board and chop into coarsely sized pieces. 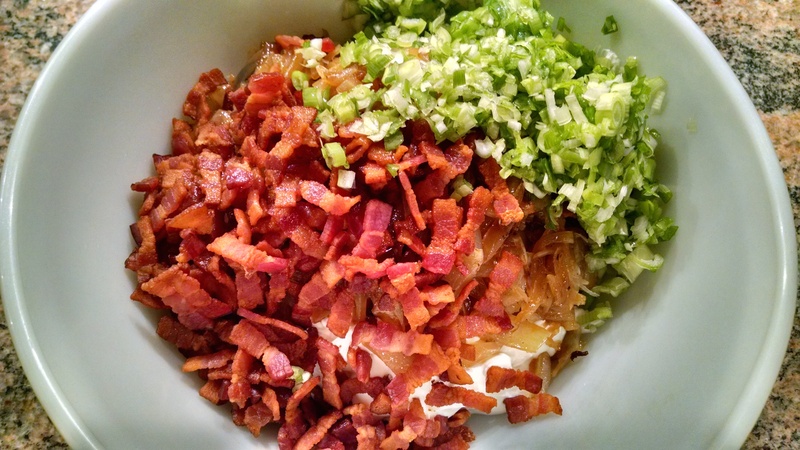 In a large bowl combine the onions, bacon, scallions, sour cream, and cider vinegar. Season with salt and pepper. Eat! I recently discovered Sourdough! Last summer my aunt gave me some of her sourdough starter. The starter has been passed down for generations and originates from the 1930s! The quarter cup of starter sat in my refrigerator for over a year (thankfully it was still active). After much prodding from my boyfriend, I pulled it out and have since learned the ropes of using sourdough starter. Turns out, it is really easy and takes a little foresight to make delicious sourdough products. For Thanksgiving this year, I was in charge of pies and bread. 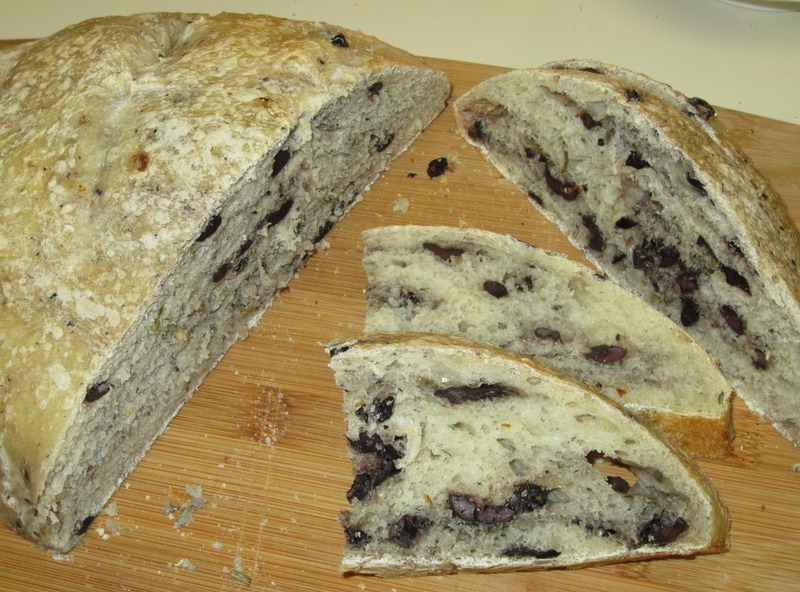 I made dinner rolls as well as this amazing recipe for Olive Rosemary Sourdough bread. The bread was delicious and already I have made it again! 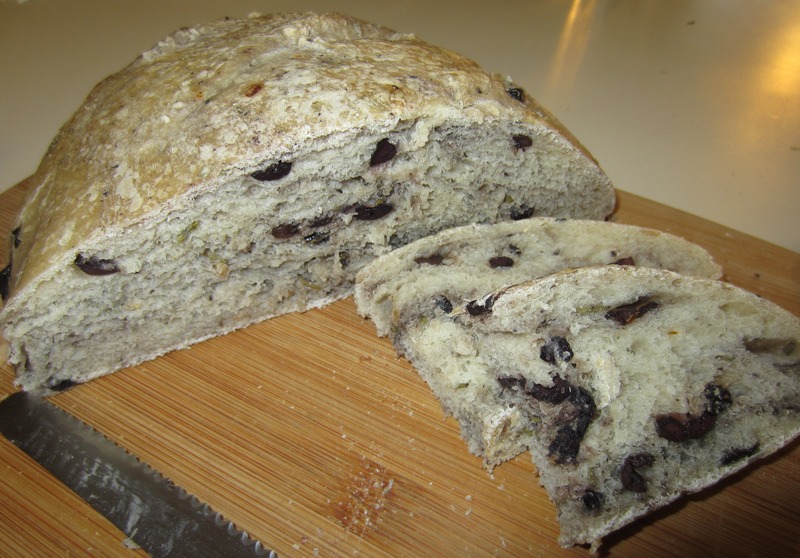 I tweaked the original recipe slightly and the bread is so good. Dense, moist, and flavorful – it disappears fast. 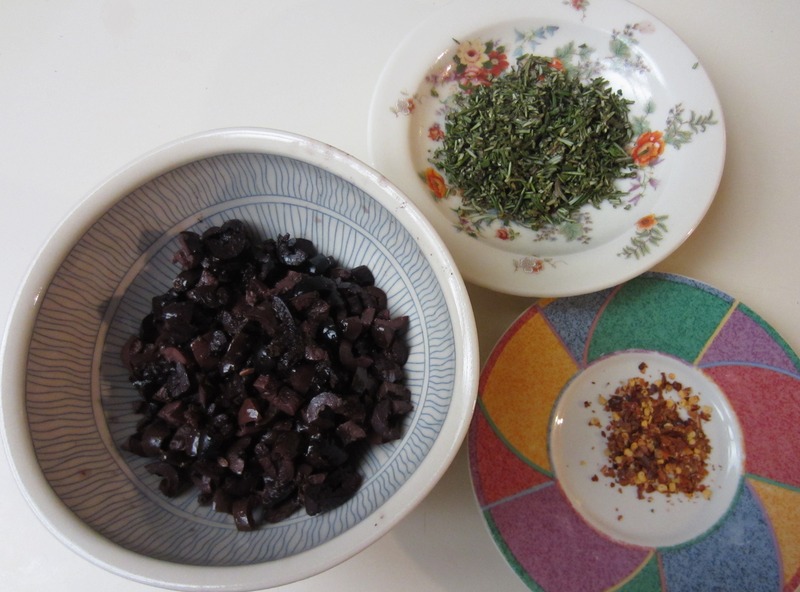 I used good-quality kalamata olives and fresh rosemary and I recommend you do the same. 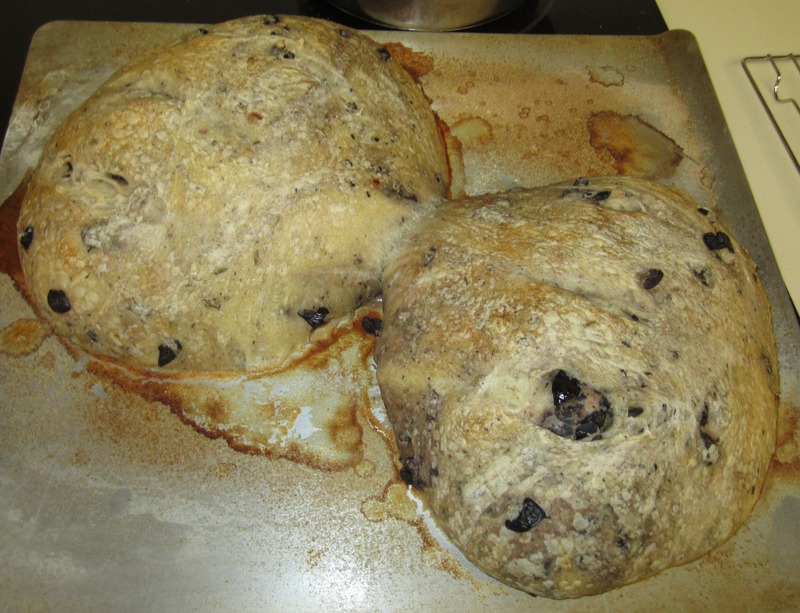 The sourdough flavor is not strong due to the other ingredients. I was also impressed there is no yeast in this recipe! Stir the sourdough starter and water in a large bowl until combined. Add flour one cup at a time until dough is formed. I used my hands towards the end, to combine the dough. Add dough to bread machine and knead for 2 minutes (I had a bread machine and not a standing mixer at my disposal – either will work). Let dough rest for 20 minutes. While the dough rests, chop the olives and rosemary. 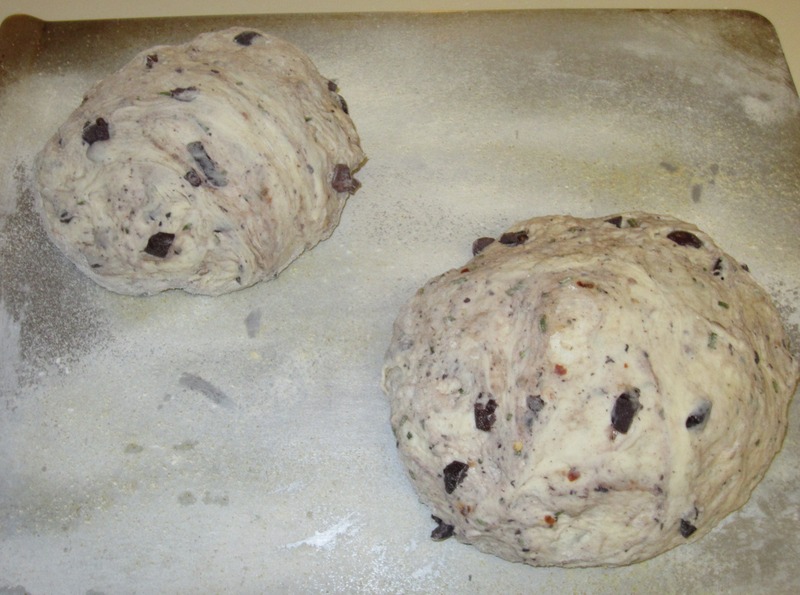 Sprinkle salt over dough and knead the dough in the bread machine for 8-10 minutes or until a good elastic dough forms. Add more flour if needed. 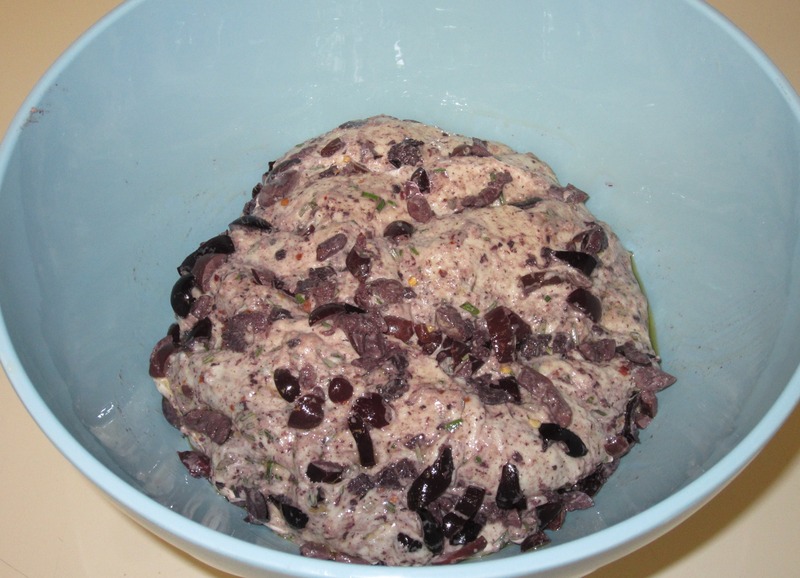 Add chopped olives, rosemary, and red chili flakes and knead to combine. I had to remove the dough from the bread machine and briefly knead by hand to incorporate everything. Move dough to a large oiled bowl (use the olive oil to oil the bowl) and cover with plastic wrap. Let the dough sit at room temperature until doubled in size – 1-2 hours. Empty dough on to a floured counter and punch down. Split dough in half (cut it down the middle) and let rest for 10 minutes. Grease a cookie sheet and sprinkle with cornmeal. Form each dough half into a round ball and place onto prepared cookie sheet. 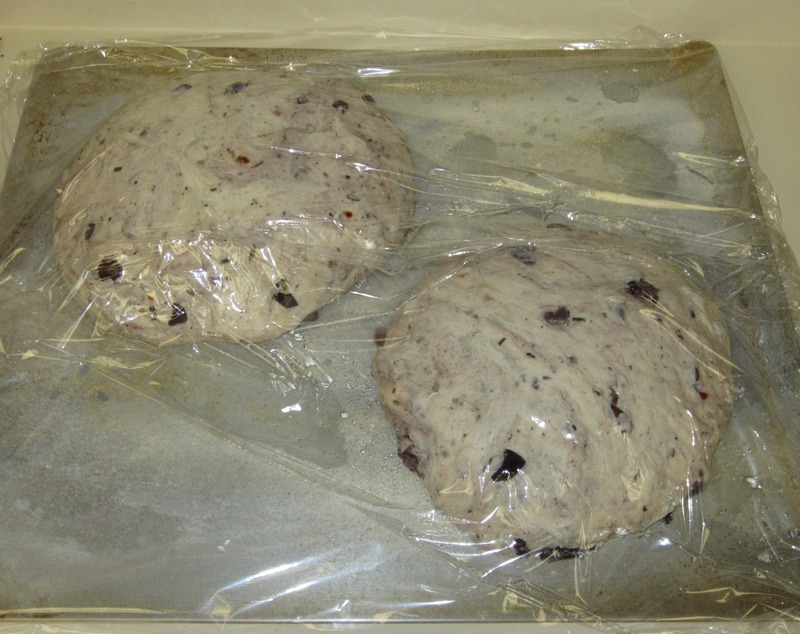 Cover with plastic wrap and refrigerate for 12-16 hours (or overnight). This lets the sourdough flavor develop. 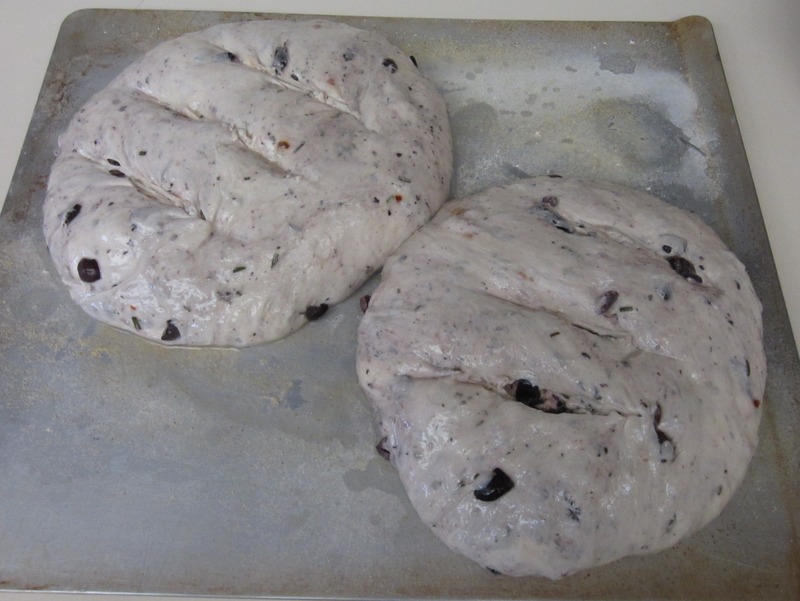 Pull dough out of refrigerator and let it come to room temperature – 2-3 hours. Preheat the oven to 400 F. Make three large, deep cuts across the top of each loaf. Whisk the egg white and 1 Tablespoon water together to make an egg wash. Brush the two loaves with the egg wash.
Bake loaves for 30-40 minutes or until lightly golden. Let the bread cool completely before cutting into it (good luck waiting!). Devour! 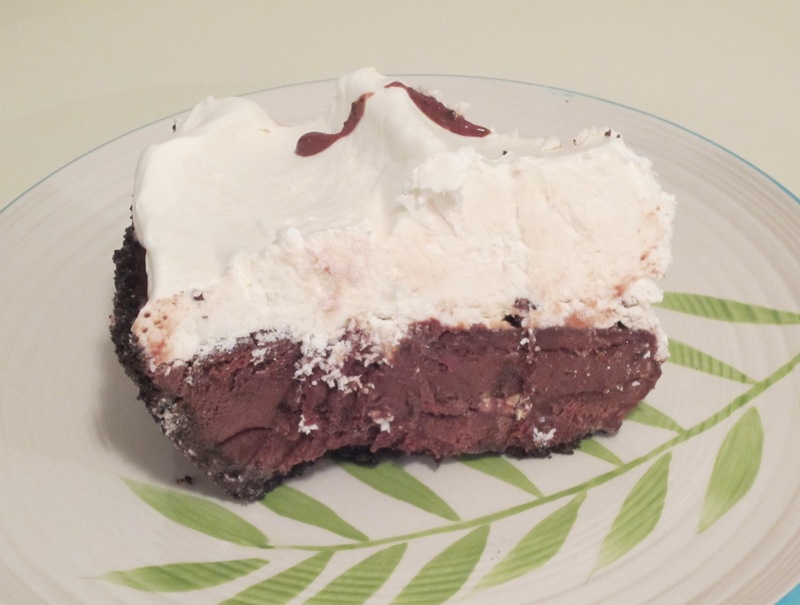 This ice cream pie is dangerous! Deliciously dangerous that is… I love the comment I wrote in my cookbook after making this recipe for the first time a few years back: “Holy s**t amazing.” The original recipe calls for coffee ice cream (which is delicious) but really, any ice cream will work. This past week was my new roommate’s birthday and his favorite ice cream is the Extreme Moose Tracks (danger zone) so voila, this creation was born. 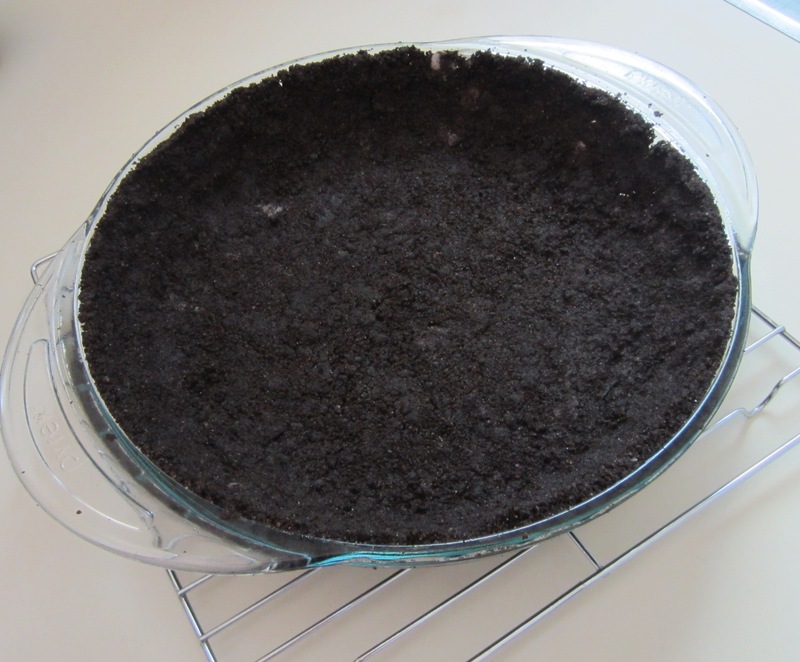 First make the crust: Preheat the oven to 350 °F. Mix the cookie crumbs and sugar together then add the melted butter. Stir until everything is evenly combined. 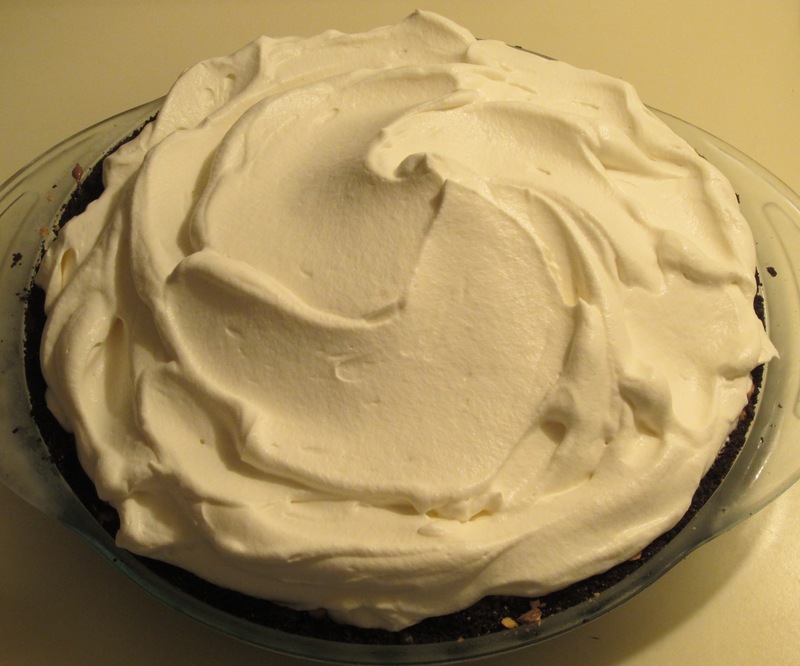 Press the mixture into a 9-inch pie pan using your fingers. 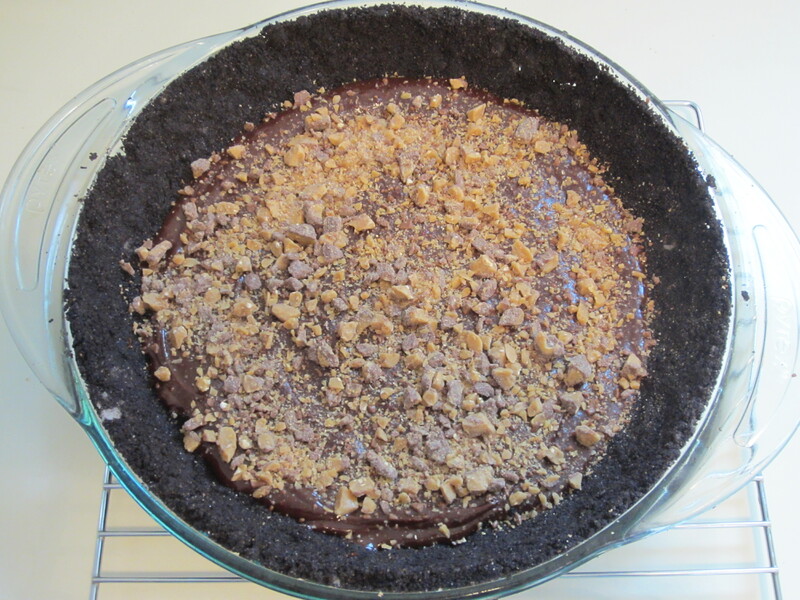 It will take a little maneuvering to get the crust evenly spread out. Bake until firm, about 7 minutes. Cool completely on rack. 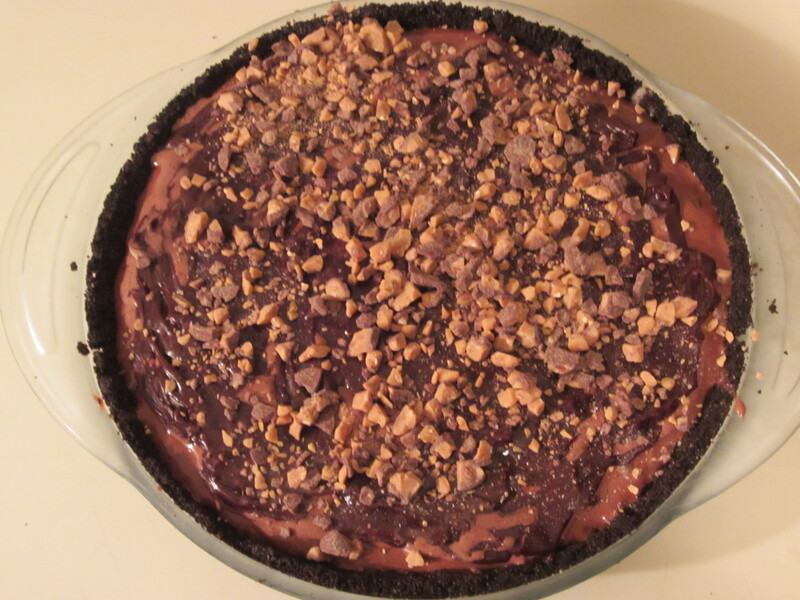 While the crust is cooling, make the chocolate mixture that will line the crust as well as cover the top of the pie. In a double boiler (or in my case, a metal bowl over a pot of barely simmering water), combine the chocolate chips, butter, heavy cream, and corn syrup. Stir occasionally until everything is smooth and melted. Remove the chocolate mixture from heat and add the powered sugar and vanilla. Mix well. Reserve ½ cup of the chocolate for the top. 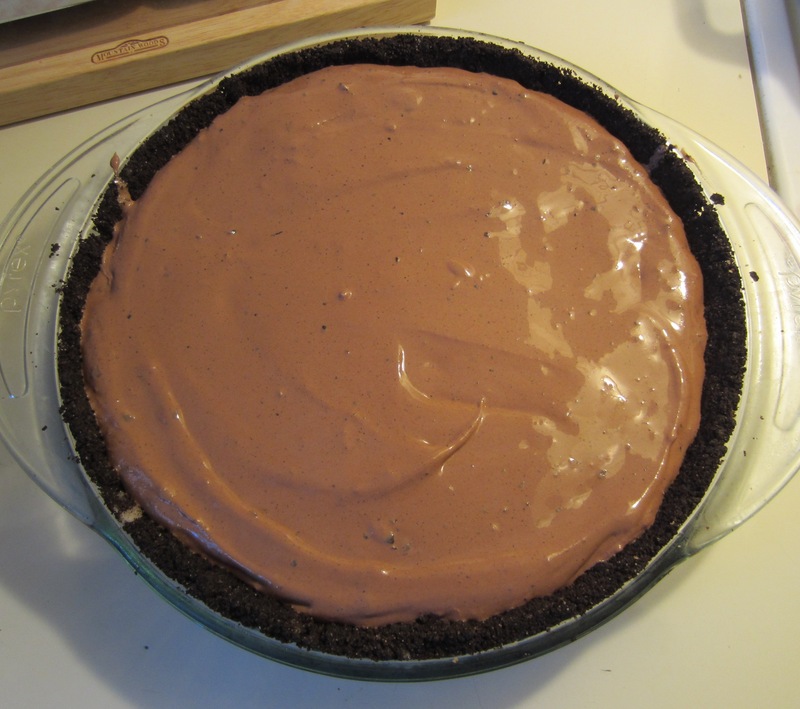 Spread the remaining mixture evenly over the bottom of the pie crust. I recommend pouring the mixture evenly around the bottom so there is minimum usage of a spatula. 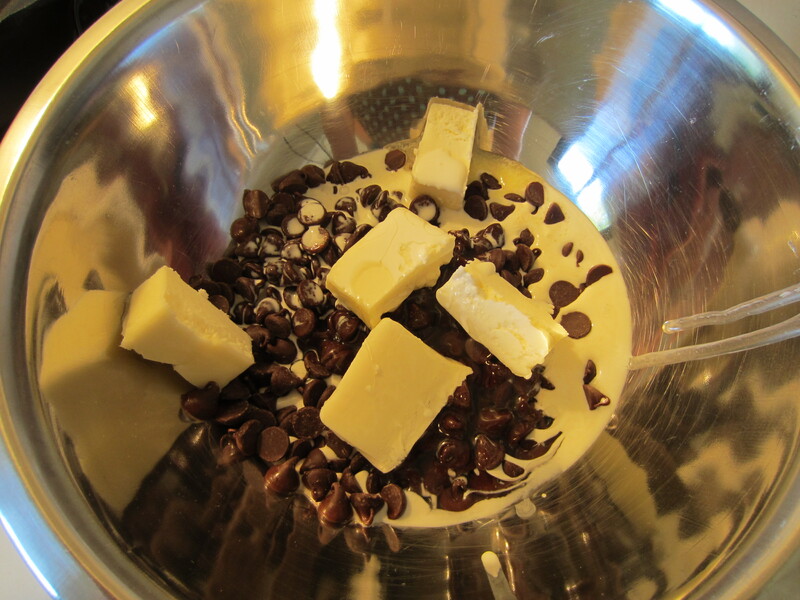 Sprinkle with half the toffee chips (¼ cup). Refrigerate until well chilled, about 1 hour. Let the ice cream sit at room temperature for about 10 minutes or until softened. In a large bowl, use an electric mixer and beat the ice cream until it is spreadable but not runny. 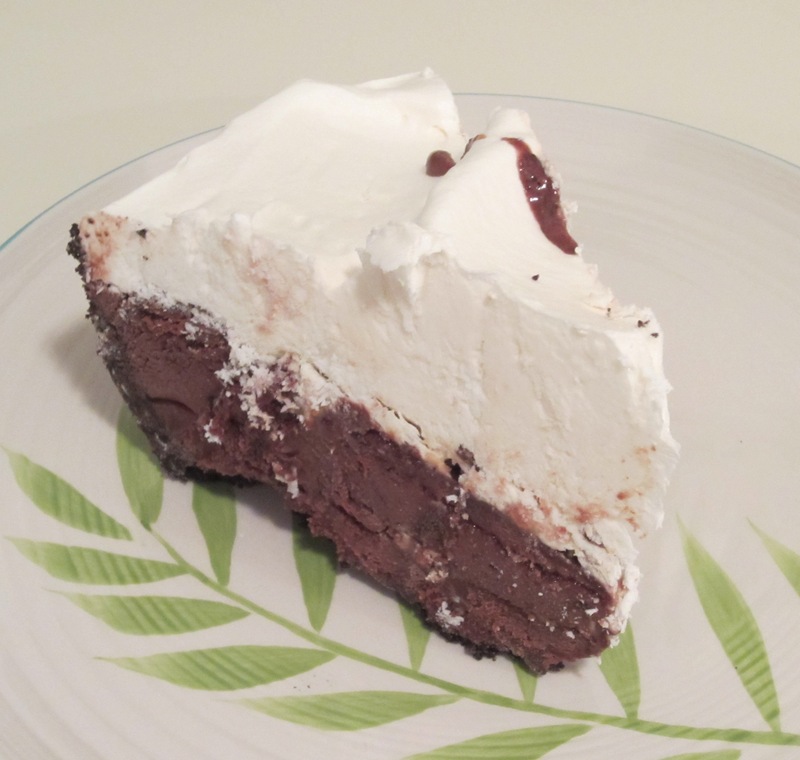 Immediately pour the ice cream into the chilled crust and freeze until firm – at least 2 hours or up to overnight. Reheat the reserved chocolate mixture either in a double boiler or in the microwave. Now important tip: WAIT until the mixture is cool (spreadable but cool) and then spread over the ice cream. I did not wait and accidentally melted the ice cream on top which led to a messy chocolate/ice cream topping. Next sprinkle the remaining toffee bits over the top and return to the freezer. Freeze for at least another hour. Finally, the whipped cream: Using a standing mixer, combine the heavy cream, whiskey, vanilla, and powered sugar. 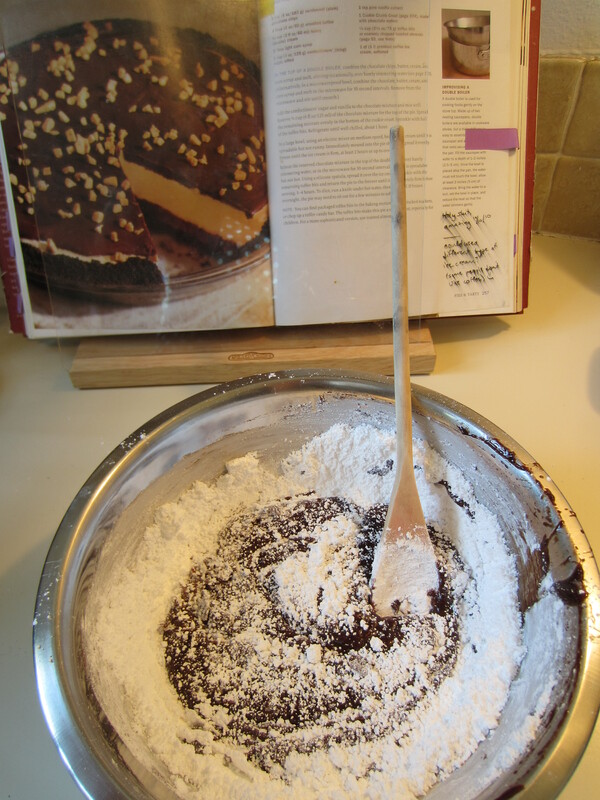 Using a wire whisk attachment, whip on medium-high speed until soft peaks form, about 6-8 minutes. 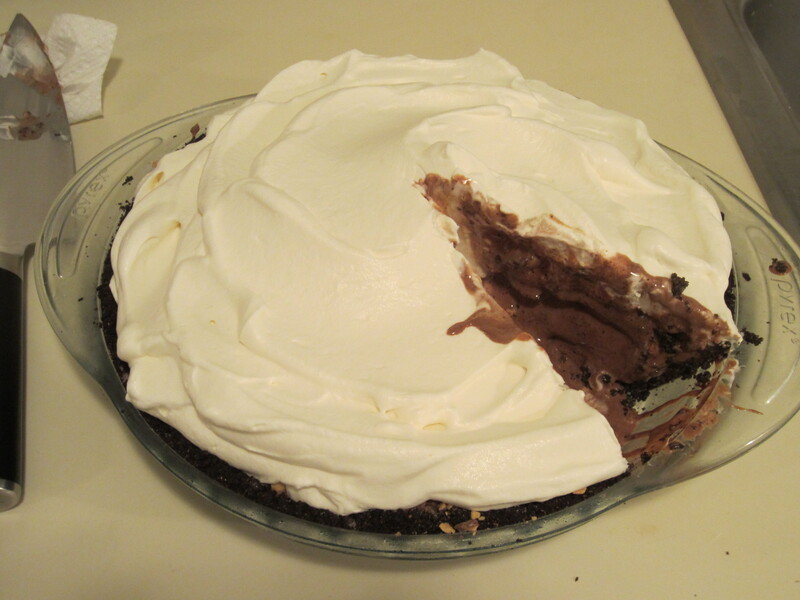 Remove the ice cream pie and top with the whipped cream. Return to the freezer and freeze until firm – at least 3-4 hours. Then… devour.